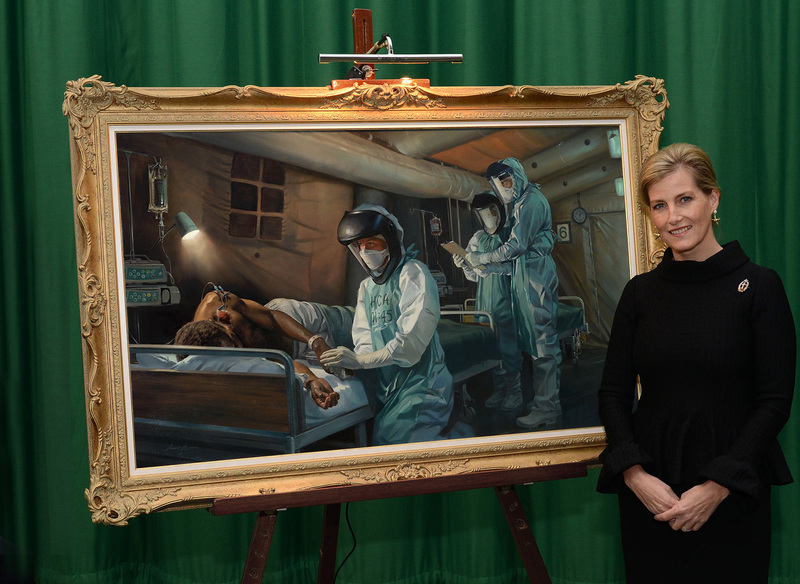 Commissioned by Queen Alexandra’s Royal Army Nursing Corps. 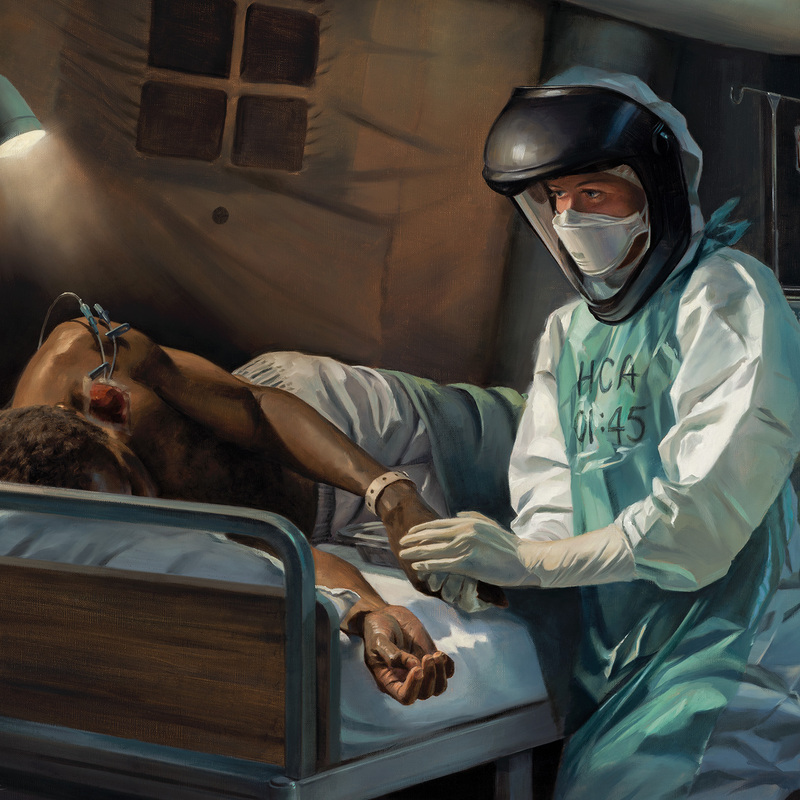 During Operation GRITROCK in Sierra Leone from 2014-15, personnel from the UK Defence Medical Services and the Royal Canadian Medical Service provided clinical care for Ebola patients that was both advanced and compassionate despite the hazardous and arduous nature of the work involved. 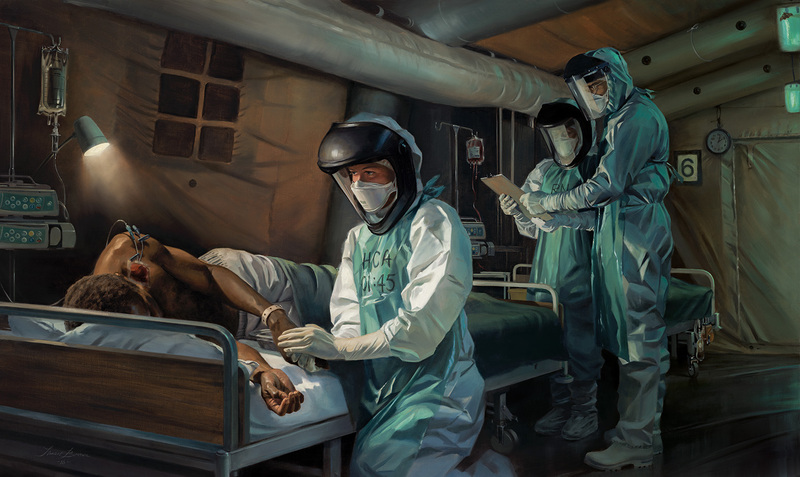 On 8 August 2014, the World Health Organisation (WHO) declared the Ebola crisis in West Africa a Public Health Emergency of International Concern (PHEIC). In response to this, the United Kingdom (UK) government launched a combined civilian and military effort to provide planning, engineering, logistical and medical support to the Sierra Leone government. The military component of this was Operation GRITROCK, which made the UK Defence Medical Services (DMS) responsible for the design and running of an Ebola Virus Disease Treatment Unit (EVDTU) for affected healthcare workers at Kerry Town on the Freetown Peninsula. DMS personnel began an intensive training programme on 24 September 2014 and deployed to Sierra Leone on 16 October 2014 and the EVDTU opened on 5 November 2014 and colleagues from the Royal Canadian Medical Service joined from 28 December 2014 onwards. 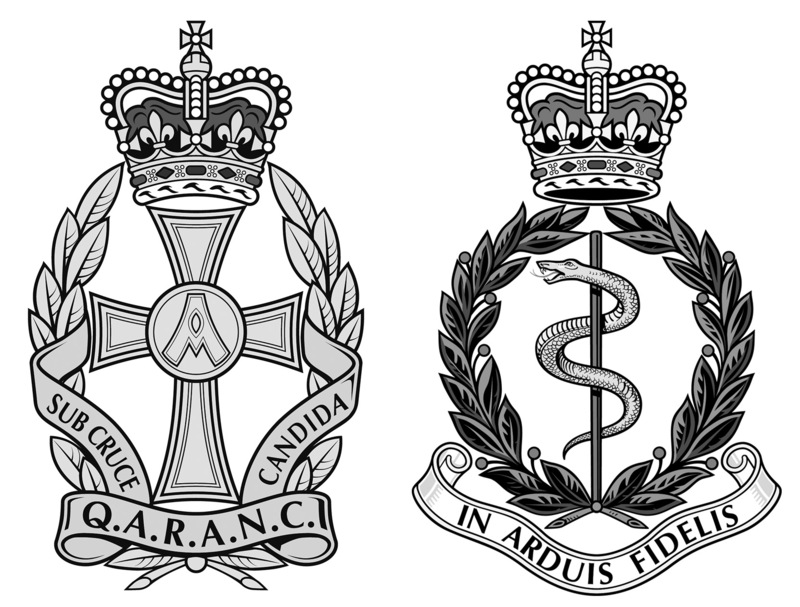 The British and Canadian staff then worked together through a total of four roulements until the end of the deployment on 30 June 2015. This EVDTU was designed to provide the highest level of care possible in order to provide reassurance for both local and international healthcare workers who were involved in combatting the Ebola outbreak in Sierra Leone. The DMS personnel running the unit consisted of physicians, nurses, healthcare assistants, combat medical technicians, allied healthcare professionals and medical support officers. 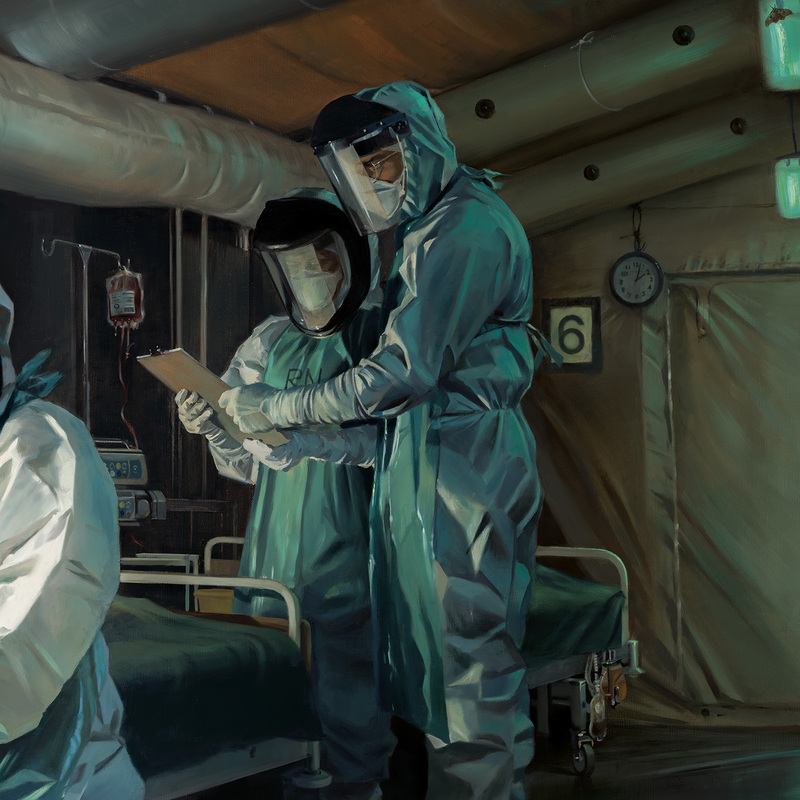 ‘What Matters Most’ is set inside the ‘Red Zone’ isolation area of the EVDTU and depicts members of the multi-disciplinary team working together to provide clinical care for an Ebola patient. 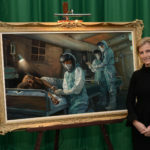 The hazardous nature of this work was well-known from transmission of the disease to healthcare workers even with the best resources in developed countries. It was also arduous due to the wearing of personal protective equipment (PPE) in a tropical environment that led to exhaustion within 1-3 hours of work. Although the advanced level of technical healthcare provided was important in achieving the best possible outcomes, so too were the basic personal care and emotional support offered to patients who were suffering from a terrifying disease and had prolonged separation from human contact. Clinical staff seemed to have enough confidence in their equipment and training that they were not inhibited from offering compassionate care to patients despite the complexities of the treatments being given and the risk to themselves. WHO ended the PHEIC on 29 March 2016, but not before the Ebola epidemic had claimed the lives of over 11,000 people in West Africa and left thousands of others with the after-effects of the virus. The British and Canadian military personnel who deployed to Sierra Leone can be credited with putting themselves in harm’s way as they contributed to the large-scale international effort to bring the outbreak under control. Operation GRITROCK also enhanced DMS capabilities for further humanitarian operations in the future.